There now, that’s better, isn’t it? It feels like the world has just heaved a tremendous sigh of relief, and even those of us who tried to bury our heads in the sand and avoid the whole election drama (who, me?) feel like a very heavy weight has been lifted from our shoulders. It’s funny, since despite my best efforts to not think too much about it until the whole thing was over (including, for example, forbidding Manuel from sharing the latest poll results he devoured eagerly each morning), I seem to have been reduced to a nervous wreck by this election. On Monday afternoon, for example, I walked into a coffee shop, paid for my cafe au lait, and walked out without my purse. What’s more, I didn’t even notice until eight o’clock that night when our phone rang and it was one of the staff calling from my cell phone to let me know someone had handed it in. It only got worse on election day, though. I couldn’t even sit still, let alone get anything useful done; all day I paced around the house like a caged animal, a growing knot of anxiety gnawing away at my belly. It felt like I imagine it would feel if if I were waiting for news of an injured loved one in the hospital, helpless and impotent. After obsessively refreshing the homepages of every major news provider and realizing that no, there really wouldn’t be any results posted until after polls had closed somewhere in the country, I did the only thing I could to take my mind off it: I made dinner. Thankfully, the chopping, frying and simmering not only did wonders for my frazzled nerves, it also reminded me that the very dish I was making is something I’ve been meaning to tell you about ever since our trip to Lyon in June – which, now that I think about it, I never told you about either. Well, it was pretty last minute and not very long; we were asked to contribute to a publicity campaign for the beautiful Hotel Le Royal for which they asked us to ‘experience’ the city as any first-time visitors might, then write our experiences up into a kind of blog-inspired scrapbook for their website. Since Lyon is considered the gastronomic capital of France, it didn’t seem too much of a stretch to equate ‘experiencing the city’ with ‘eating’, or at least that’s how I rationalized it when we came up with an itinerary that included exactly two museums, one cathedral, and oh, seven or eight restaurants. Well, to make a long story short, Lyon is a beautiful city, particularly in June when the lavender is blooming and the scent wafts through the narrow streets of the old town, and the architecture and cultural attractions are certainly first-rate, but really, the undisputed highlights of our trip were the restaurants, and in particular the famed bouchons. These cheerful working-class eateries, whose praises I’m certainly not the first to sing, offer little in the way of innovation or imagination, but that’s quite alright when you have a traditional cuisine as delicious as Lyon’s. We ate in four of them, I believe, which was just enough to be able to compare the various versions of quenelle de brochet (pike dumplings in crayfish sauce), saucisses aux lentilles (fat sausages with lentils), and boudin noir (blood pudding), and to decide that as delicious as all of these might be, my favorite might just be the only one I actually had a shot at recreating at home: the poulet au vinaigre, chicken in vinegar sauce. The best analogy I can come up with for this dish is what you might come up with if you stripped a coq au vin of its embellishments, focused and clarified its flavors, and made the whole thing, well, more honest. It’s a deceptively simple dish, actually, just a plump chicken simmered for a while in a syrupy reduction of vinegar and wine, the kind of thing you might imagine a resourceful Lyonnaise housewife first threw together when the larder was nearly bare, pairing it with some humble potato puree or a hastily assembled gratin. It’s easy enough that we’re having it on at least a bi-weekly basis, but special enough that it always seems like an occasion when we do. In fact, this is one of those rare dishes that seems to be at home in just about any situation: as the centerpiece of an intmate dinner with good friends, as belly-warming fortification after an afternoon of raking leaves or shoveling snow, or even, I am happy to report, as the prelude to an evening of jubilant post-election celebration. 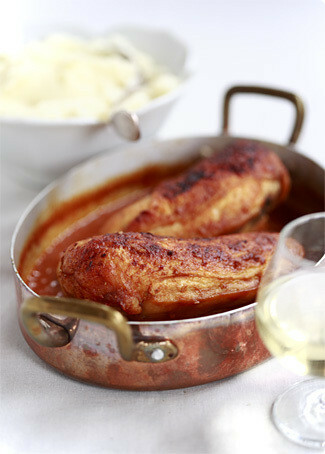 There are plenty of differing opinions on poulet au vinaigre (both in the Lyonnais version and the versions found all over France); some insist on tomato while others reject it, some use cream while others prefer butter, and some use only vinegar and no wine, so feel free to play around with the recipe if you like. What everyone seems to agree on, though, is that the sauce should be a good balance of rich and tart, and that the chicken should be a good, sturdy free-range bird, the kind that can stand up to long, slow cooking. As for accompaniment, something starchy and creamy seems to be a natural; in Lyon we had it served with a nutmegy macaroni gratin, but I find I’m partial to a bowl of good old mashed potatoes, which soak up the delicious sauce particularly well. Season the chicken to taste with salt and pepper. Heat the oil and 2 tablespoons (30g) of the butter in a large frying pan over medium high heat. Working in batches, brown the chicken on all sides, removing them when done and setting aside on a plate. Pour off all but a thin coating of fat from the pan. Reduce the heat to medium and add the minced shallots and garlic and cook, stirring frequently, until slightly soft, about 5 minutes. Deglaze the pan with the vinegar and wine, add honey and scrape the browned bits off the bottom of the pan. Reduce the liquid by about one-third, about 3-5 minutes, then stir in the tomato paste. Add the stock and the browned chicken, lower the heat to medium-low and cover the pan. Simmer the chicken, turning and basting it every ten minutes or so, for about 45 minutes, or until the meat is fork-tender (I usually remove the breasts about 10-15 minutes before the thighs and legs). Remove the chicken from the pan and set aside again. Increase the heat to medium-high, and continue cooking until the sauce is thick and glossy, about 5 minutes. Cut the remaining butter into small pieces. Remove the pan from the heat and whisk in the butter one piece at a time. Adjust the seasoning; add salt and pepper and additional vinegar if needed – it should taste rich yet tart. You can also strain the sauce at this point for a more elegant presentation, though I don’t bother. Return the chicken to the pan, turning to coat evenly with the sauce. Serve hot. Sigh of relief indeed. This chicken looks wonderful, I can’t wait to give it a try. Election fever spread all the way to Australia, I can assure you. I spent most of the day refreshing the page too! I really love the sound of this dish! I sat in front of the TV from 1pm (Seattle time) until 8:30pm – thank goodness they called the election about 8:05pm; soon as the west coast voting closed. Camelot is back! I took the recipe and will make it with chicken thighs as that’s our favorite too! I was lucky to be able to see live reports here in Japan…that chicken recipe sounds really good! Awesome stuff. A great photograph, and a great recipe.This was the year that really sucked me into American politics. Both sides just found it a scary thought that the other could be in power – all very interesting stuff.As regards rustic French food – French Provincial Cooking, by Elizabeth David is just amazing for recipes like this. My favorite memory of Lyon is asking repeatedly (in French) if a restaurant could make something for me that was vegetarian, and being told – repeatedly (in French), "No, I’m so sorry." It was very clear to me that they were not apologizing because they couldn’t accommodate me but because being a vegetarian meant I couldn’t enjoy their fabulous food! So happy to see you were inspired by Lyon. It all builds up and then we can’t find a place to hop on in and start unraveling the great experiences that happen one after the other. This is a lovely post. Thank you for the inspiration. Sigh of relief right here(Scotland) too. My husband and I stayed up till 5am watching the results come in, I couldn’t go to sleep not knowing. It was a wnderful moment to witness.mmmmmmmmm chicken. Thanks a lot for the recipe! This chicken looks so fine!. You made me so happy with this dish! It is my mom’s signature dish to make when we get home, and she is not even from the region. Your pictures are always perfect! Thank you for sharing your stories and your recipes. I lived in Lyon for a year and this post just brought me back. I get excited whenever I see anything Lyonnaise! I’m so excited to have stumbled upon your blog. Merci! this recipe is sooo delicious! i added a handful of leftover mushrooms to the mix and thickened the sauce… this is definitely going to be one of my favorites!